How does the HFC court ruling impact your operations? That's why we've updated our handy Refrigerant Use Chart to reflect what's new, including the latest on the legal battle involving EPA SNAP Rule 20. 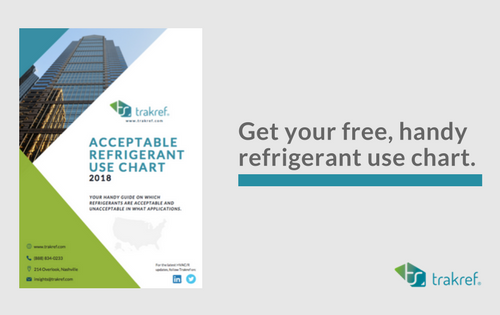 Prepare and plan ahead now with the trakref® refrigerant use chart. On Jan. 27, 2018, the Cooling Post reported that the U.S. Court of Appeals for the District of Columbia denied to hear an appeal of the Mexichem Fluor, Inc., v. EPA decision made earlier this year. This case vacated a part of SNAP Rule 20 that banned HFCs in certain HVAC/R applications. What is Mexichem Fluor, Inc., v. EPA? On August 8, 2017, the D.C. Circuit Court of Appeals vacated part of EPA SNAP Rule 20 in a court case known as Mexichem Fluor, Inc., v. EPA. On September 22, Chemours and Honeywell along with the National Resources Defense Council (NRDC) “filed a petition appealing the recent US court decision," The Cooling Post reported. That petion has now been denied. What is EPA SNAP Rule 20? It's a 2015 EPA refrigerant management rule that banned some high-GWP HFCs in certain end-uses. For instance, R-404A, a popular HFC, was listed as unacceptable in new remote condensing units as of January 1, 2018, and in new stand-alone low-temperature units as of January 1, 2020. However, because the petition to appeal has now been denied, these HFC bans have been overturned with the Mexichem Fluor, Inc., v. EPA decision. Is it now safe to use these once-banned HFCs? Well, don't throw your cares to the wind just yet... We urge end-users to be cautious about using high-GWP HFC refrigerants. While we have updated our refrigerant chart to reflect the August 8th court decision, please be weary moving forward. The state of California has signaled it may adopt provisions of SNAP Rule 20 into its own state regulations. For more information on this, please see trakref's article "California May Adopt New Refrigerant Management Rules for HVAC and Refrigeration Equipment." Trakref is a simple, affordable, and comprehensive HVAC/R and refrigerant asset management software for facilities and the people that service, manage, and report on them. With over two decades in the international refrigerant reclamation business, we distilled industry best practices and regulatory requirements into a single, powerful, user-friendly digital tool: trakref. By leveraging four transformative elements—communication, benchmarking, asset management and compliance—trakref combines all the essentials to achieve optimal performance, efficiency and value from commercial HVAC/R systems. More than just a software, it's a HVAC/R rules engine embedded with regulatory requirements and best practices to guide you and your workforce. No matter your facilty, unlocking unprecedented HVAC/R insights and achieving compliance success has never been easier. EPA 608 2018 is here. Get the checklist now!